As I've shared with you a few times so far this year, I'm very focused and intentional about passing on a heritage of faith to my three sweet grandsons. One way I'm doing this is by praying Scripture for them. But, I do not stop at just praying Scripture for them. Most weeks my grandsons spend Friday night at my house on a sleep-over, so on Saturday, we sit at the table, or on the sofa, and look at the verses their Poppa and I have been praying for them throughout the week. They get to hear us pray for them; and they have the opportunity to pray as well. (I LOVE hearing them pray!) We talk about their prayer requests from the previous week and how God is answering their prayers. Then, we look at the passage we will praying for them in the coming week and talk about what the verses are saying. I have the boys draw another prayer request, which we can pray about for them in the coming week, and then we all pray together. I want my grandsons to hear us praying for them; not just hear me saying we will pray for them, and so far, the boys - especially Josiah, are enjoying this time of prayer. They seem to really appreciate how we are praying for them and are starting to understand what it means to pray Scripture. In the coming week we are praying Psalm 119:1-16 and the prayer requests the boys have given us. I'm praying my grandsons will love God's Word and will want to follow it all their lives. I'm praying they will learn to turn to God's Word throughout their lives when they have to make a decision, they will love God's Word more and more, and will experience great joy when they make the choice to obey it. Dear God, on this day I thank You for giving me Your Word, so I can know the way You want me to walk. Please help me keep Your Word and seek You with all my heart. I want to follow Your ways; I thank You for laying down precepts for me to fully obey and for blessing me when I obey. ‘Oh that my ways were steadfast in obeying Your decrees! Then I would not be put to shame when I consider all Your commands. I will praise You with an upright heart as I learn Your righteous laws.’ I will obey Your Word and thank You for being with me! Sometimes I wonder how I can stay on the right path, but then I praise You for giving me Your Word because if I live according to it, I will be on the right path! I choose to seek You with all my heart, please do not let me stray from Your commands. Please help me hide Your word in my heart so I will not sin against You. ‘Praise be to You, LORD; teach me Your Word!’ I rejoice in following Your Word and meditate on it. I delight in Your Word and will not neglect it! 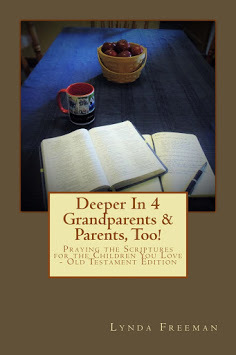 Thank You, God, for giving my grandchildren/children Your Word, so they can know the way You want them to walk. Please help them keep Your Word and seek You with all their heart. Please give them hearts which sincerely want to follow You. Please help them make the choice to obey You fully and when they do, please give them Your blessings. As they learn more about Your Word, please fill their hearts with praise and give them the desire to obey You more and more. Thank You for being with them. When they wonder how they can make the right choice, please remind them of Your Word and help them choose to live their lives according to Your Word. As they grow up, please help my grandchildren/children choose to never give up seeking You with all their heart and want to remember and understand God’s Words, so they will not sin against You. Please teach my grandchildren/children Your Word and help them experience the joy which comes from meditating on and following it. Please help them love Your Word more and more and experience the delight which comes from reading it every day. Thank You for Your great love for us; I love You, too! Amen!